Grand Teton National Park and Jackson Hole are popular vacation destinations for good reason: there’s plenty to do, and Yellowstone National Park lies just an hour to the north. It’s no wonder that thousands come here each year to revel in nature’s majesty! Join us for an excursion that is off the beaten path, to places where the call of the wild is clearest. We are the only outfitter permitted to run overnight kayaking trips on the pristine Jackson Lake, ensuring a distinct, peaceful experience far away from the everyday crowds but in full view of the magnificent Tetons. Paddle your kayak through morning mist with the sun rising behind you, spot wildlife in grassy meadows and forest glens, camp at secluded sites on the lake – where we’re more likely to see a bald eagle or a moose than another human being – and hike to scenic overlooks and rushing creeks. This trip thoroughly captures the wilderness splendor of Wyoming’s pristine backcountry, making it an ideal trip for families with children of all ages. On the morning of your trip we’ll gather at the Signal Mountain Public Boat Ramp, located inside Grand Teton National Park. Here you meet your guides and the others on your trip—all sharing in excited expectation of what’s to come. You will also be given your waterproof bags for you to pack your gear. After your guide presents a thorough demonstration on kayaking techniques and safety procedures, we’ll be on our way. Our personal gear will be safely stowed in a motorized snout rig which will act as a support boat – supplying lunch and carrying our gear and equipment. Depending on water and weather conditions, we will board sleek one- or two-person touring kayaks en route to our base camp. As we move across the lake we stop periodically to relax, have a bite to eat and revel beneath the towering peaks of the Teton Range. It is seven miles to our secluded campsite on Grassy Island and to Spalding Bay, both perfect jumping off points for the adventures ahead. Spend the afternoon however you choose; finish your novel, paint a sunset or pull in a cutthroat trout worthy of tall tales. A guide will lead short paddles on the lake and perhaps to the Moran Canyon area on shore. Here we may hike up a rushing creek to scenic overlooks of the lake, all in the shadow of majestic Mt. Moran. You’ll probably find that paddling can inspire quite an appetite – and dinnertime comes none too soon. Your tastes may be less discriminating when eating in a wilderness setting, but ours are not. The menus we serve will surprise you with their diversity, quality and presentation. Our evenings in camp are as magical as our days, and after dinner we might enjoy a moonlight paddle or perhaps a bright and cheery campfire where we’ll gather for conversation, stories and laughter. Fall asleep under the stars of the wide Wyoming sky, content in the knowledge that it’s a rest well earned. We’re sure you’ll agree that the more time you spend on Jackson Lake, the more comprehensive your experience will be. Three days will give you time to sample all the activities that this tranquil and rich wilderness area has to offer. Countless miles of shoreline beg to be explored; perhaps we’ll encounter a moose drinking from the shallows, an eagle perched in a nearby aspen, or a family of deer quietly foraging in the woods as we glide past the shore in our silent kayaks. There are hiking trails to explore, and the beautiful lake constantly beckons us to swim or fish in its sapphire waters. After a scrumptious breakfast, we’ll load up early for our return trip to Signal Mountain. Leaving our kayaks and Jackson Lake behind, we’ll drive 20-minutes around the dam to access the river portion of our journey. We put in at Pacific Creek aboard sturdy rafts, expertly maneuvered through the maze of the Snake River’s braided channels. Wildlife is abundant and the sightings are many as we meander across the valley floor. Look for wild trout as we float along, but fishing is not allowed. Bear and bison, moose and muskrat, beaver and bald eagle all frequent this area with amazing regularity. Stunning views of the Tetons, the jagged range in the Rocky Mountains, develop and change as we follow the twists and turns of the river’s passage. Each bend offers a new excuse to snap a few photos- the river rambles past, the Tetons loom majestically in a bright blue sky, cottonwoods, aspen stands and lodge pole pines burst in all shades of green. All told, we will have covered 10.5 river miles, ending our journey at Deadman’s Bar near the southern end of the park. Your car will be waiting for you here, having been shuttled from Pacific Creek. We will meet at 11:00 AM at the Signal Mountain Public Boat Ramp in Grand Teton National Park, 5 miles west of the Moran Junction entrance. Signal Mountain Marina Road dead-ends at the boat ramp. Please see GPS coordinates above. Please note: you must pay a $30 fee per vehicle to enter the park. There is also a permit for $50, which is good for 7 days entitling you to entrance to both Grand Teton and Yellowstone National Parks. Your guides will distribute your waterproof bags so that you can pack your gear. Most people fly or drive to Jackson and stay in town the night prior to the trip, then drive to the meeting place the morning the trip begins. Driving time from downtown Jackson to the meeting place is approximately 45 minutes to one hour. If you’re arriving by car, parking is available at the Signal Mountain Boat Ramp. 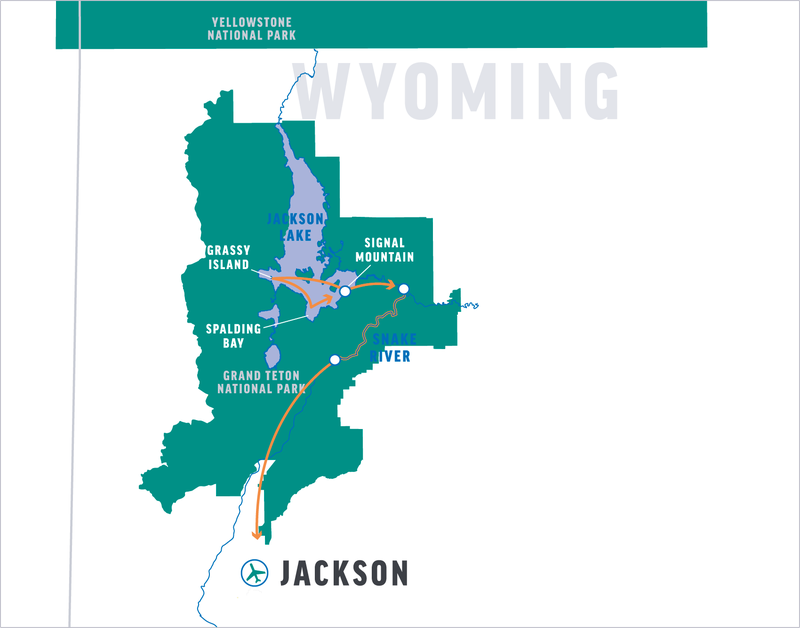 Mountain States Express (Alltrans) (800) 652-9510 / www.jacksonholealltrans.com provides a daily shuttle service to Jackson from Salt Lake City. In the afternoon on Day 3 of your adventure, your trip will finish around 4:00 PM at Deadman’s Bar take-out on the Snake River. Please note: Following the kayaking portion of your trip (ending at 10:00 AM at Signal Mountain Boat Ramp), you will drive your car from the boat launch to the Pacific Creek put-in for the Snake River. While you are on the river, your car will be shuttled from Pacific Creek to the take-out at Deadman’s Bar and will be waiting for you when you get off the river. The Lexington does allow extended parking for guests. Sea Kayak— The ultimate flat water explorer—at home in open seas or inches from shore. Stealthy, quiet and quick, sea kayaks are the premier platform for wildlife viewing. From alpine lakes in Wyoming to island hopping in Baja or Galapagos, sea kayaks are a low-impact way to get out on the water. Generally two-person kayaks are provided; single kayaks may be available upon request. A motorized snout-rig raft is used as a support boat on the lake. Children as young as 4 may accompany the trip. Due to kayak design and the required pace for our trips, we must restrict requests for single kayaks to those with a height of 4’11” or taller, and 14 years or older. Previous paddling experience is highly recommended. Children younger than 14 must ride in a double kayak with an accompanying adult. We’re very sorry that we’re unable to accommodate children younger than 14 if there isn’t an adult in your party to paddle with them. After an active day on the water, we pull ashore to camp for the night. Upon arrival, our first task is to unload the boat using a bag line of crew and passengers to expedite the process. Individuals then collect their waterproof bags and locate an area on the beach to camp for the night. A crew member will give a demonstration on setting up a tent, which you’ll see is quick and easy. The guides will set up the kitchen and central dining/seating area with camp chairs. They will also locate a secluded area away from camp to set up the portable toilet, where privacy is assured. We provide two sodas per person per day, water and lemonade in cans. Commercial outfitters in Grand Teton National Park may not provide any type of alcohol for their guests. You are welcome to bring your own favorite beverages, alcoholic or non-alcoholic, in non-glass containers. If you choose to bring additional drinks or alcoholic beverages, please let us know in advance. For your safety and the safety of others, the consumption of alcoholic beverages is limited to camp. Each day varies, but on an average you’ll spend 4-6 hours a day in the kayaks. The rest of the time will be spent hiking and exploring, eating, or just relaxing in camp. While we generally plan at least one guided hike on each trip, we try to provide ample opportunity for the curious to explore the area at length. Because these trips are in bear country, we limit the amount of exploration clients can do on their own. Please let your trip leader know if you are an avid hiker, and plan to bring extra water bottles and good shoes. Remember, however, that all hikes are optional and you can choose to lie on the beach and take in a few tanning rays or read a book instead. The fish of Grand Teton National Park are plentiful and include brown, cutthroat, Mackinaw and rainbow trout. A Wyoming fishing license is required to cast your line in the abundant streams, creeks, rivers and lakes. However, fishing is limited to camp (by the terms of our permit). You can purchase a non-resident Wyoming fishing license in Jackson or at the Signal Mountain Lodge store for approximately $14 per day. Children under 14 years of age and accompanied by a person possessing a valid Wyoming license may fish free (and their fish are included in the accompanying adult’s creel limit). You’ll need to provide your own fishing gear. For local fishing information call Orvis Jackson Hole (307-733-5407), Jack Dennis Outdoor Shop (307-733-3270) or Snake River Anglers (307-733-3699). While the idea of an outdoor trip is appealing to most people, many are inhibited or reluctant because of modesty or uncertainty. To minimize our impacts, we carry out all solid human waste and use a portable toilet system that is set up each day at camp in a secluded location a discrete distance from tent sites. It is essentially a toilet without plumbing and is available from the time you pull into camp each afternoon until you leave camp the next day. Toilet paper and a convenient hand-washing station are provided. Bathing is not allowed in the lake or in any of the side streams that feed into the rivers. You may want to bring a solar shower or you can borrow a bailing bucket from one of the rafts to rinse off after soaping up. Both are to be used at least 200 feet away from the water source in an area that will absorb the runoff. We recommend using a liquid biodegradable soap such as Campsuds or Dr. Bronner’s www.drbronner.com which can be purchased in most stores that have a camping section and can also be used to wash clothes. You may also find a good selection at your local health food store. Disposable anti-bacterial towelettes (Coleman Swash Cloths, baby wipes, etc.) can also be purchased and are especially convenient for spring and fall trips. Even if you aren’t anticipating your menstrual period, come prepared for it. You can use sandwich-sized Ziploc baggies during the day to store feminine products while you are on the lake or hiking, and you can then discretely dispose of the baggies when you reach camp. When possible, we recommend o.b.® tampons, which are 1/3 the size of regular tampons, tuck discreetly into pockets and have less paper wrapping. If you use pads, be sure to bring extras. Many women suggest bringing a small supply of baby wipes. We provide some feminine products on most trips for emergencies. Many of our guests travel with their smartphone even though there is no cell service. On a trip like this, there is always the risk of water damage to smartphones and other electronic devices, even when they are stowed in a dry bag. If you intend to take your phone with you on the lake, consider investing in a small, waterproof container just for your phone. *The use of drones is prohibited by Grand Teton National Park. Once you are on the trip there is limited communication with the “outside world.” Our guides carry emergency phones which are strictly used to call out in case of an emergency situation on the lake. They can call out, but we cannot call them. Periodically the trip leader will check in with our office. If you have someone that needs to contact you about an emergency at home, they should call our office (800-346-6277). If possible, we will relay the message to you. For your family at home you should define for them what you consider an emergency and provide them with instructions to call our office in the event one occurs during your vacation. During the day—The best choice is an amphibious shoe that drains water, protects your toes and won’t come off in in the event of an unexpected swim. A retired pair of athletic shoes can work well, too. Sport sandals with a heel strap are a good option, especially on sandy beaches. Find professional-grade options made by Chaco® at www.chacos.com, the official footwear sponsor of OARS guides. During summer months, conditions on the lake may be hot and sunny. These trips require less gear than spring or fall trips, but thoughtful packing is still required. Protection from the sun and heat will be critical to your enjoyment and health while on the lake and during side hikes. To protect yourself from the sun’s rays, consider bringing long-sleeved shirts and pants. At the pre-trip meeting each person will be given one large waterproof bags (approximate sealed size: 33” diameter x 29” tall). This bag will be your “checked luggage” and will only be accessible in camp. Tents and sleep pads are stowed separately. Please note: If you rent our gear it will come already packed in your issued waterproof bag. Your remaining gear, therefore, must also fit into that one bag. We also provide a small waterproof bag for day use where you can keep items such as raingear, camera, sunscreen, lip balm, etc. (approximate sealed size: 17” tall x 9” diameter). The bags are cylindrical in shape and pack from the top. Please pack light, and keep in mind that camp attire is casual: comfort, convenience and boat space take precedence over style. However, staying warm and dry is also important, so do not skimp on warm layers. Everyone is required to sign a standard liability release (or Acknowledgement of Risk) form before the trip, acknowledging awareness that there are inherent risks associated with the Due to the nature of the activities, a condition of your participation is that you will sign this form and return it to our office before the trip begins. Anyone who refuses to sign the form will not be allowed to participate, and consistent with O.A.R.S. West, Inc. cancellation policy, there will be no refund of the trip fees at that time.